I'm thrilled to be the Guest Designer today for Playing In Paradise Challenge #93! The new challenge is to "CASE Yourself!" This was a really fun challenge for me--I enjoyed looking back through my card posts to find something to CASE! I hope you'll try to play along--everyone is invited to play! There are no requirements or restrictions on what products you can use to create your challenge entry. 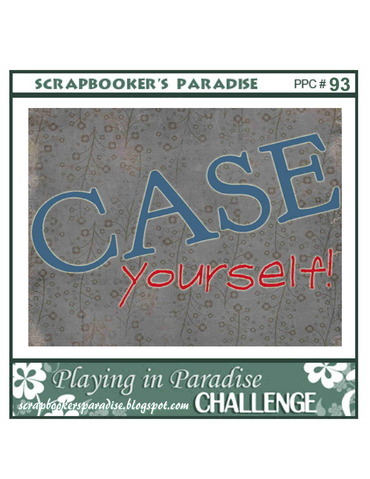 Just check out the Scrapbooker's Paradise blog to link up. Challenge #93 is open until noon on Thursday next week. Beautiful card- love the Toile BG and how pretty is the pop of Pink! Congrats on the Guest DT! Oh, I love it! That toile is gorgeous, and the ribbon rose & pearls are perfect embellies :) I'm SO GLAD you could play along with us this week, Emily - WOOT!! Such pretty cardstock! Love the colors, and the cased one is just as sweet!! Congrats on your Guest spot!!! What a fun challenge. Love your toile cardstock and the pink is fabulous with it. Congrats on your guest designer position. Congrats on being GD this week Emily :). What a pretty card, I love the black and white with a touch of pink and the little rose is darling. Emily, thank you so much for being our Guest Desginer. You certainly rocked the redo on this one. I hope to see more of your lovely work in our challenges. congrats on being the guest designer...this card is gorgeous.. Love the black and cream with the hint of pink..looks awesome..
YAY for your guest spot Emily! The pink and black is so pretty together and your toile is fabulous! Gush...love this card and that toile paper makes me drool! That's funny to CASE yourself, but you've made another beautiful card. The toile is to-die-for! Love the stitching, too! This is a beautiful card - both times! I love both colour combinations - thanks for guest designing for us this week! Congrats on the GDT! Your new creations is beautiful and a great take on your older one. I like this more girlie one. Your card looks amazing. I love both of them. Sound like a fun challenge. CONGRATS on being GD! LOVE the toile paper with the pink accents! Just YUMMY! Beautiful cards! The paper is so yummy that it holds the card without needing a lot of other stuff! Both cards are fabulous Emily! Love the stitching and the black and pink and that gorgeous image! I am so amazed by your card. I love that patterned paper but would never know how to make it work myself. Love it paired with pink too. Big congrats on your GDT! They are an awesome group of ladies! What a neat challenge! Your card is awesome! The paper has me swooning as well as the colors! that rose is so beautiful! Well done! I helped my niece make a card yesterday based on your design and it was so cute. She added little bells on a ribbon instead of chipboard. And then we were in a rush when she had to leave and I forgot to take a pic of it. D'oh!